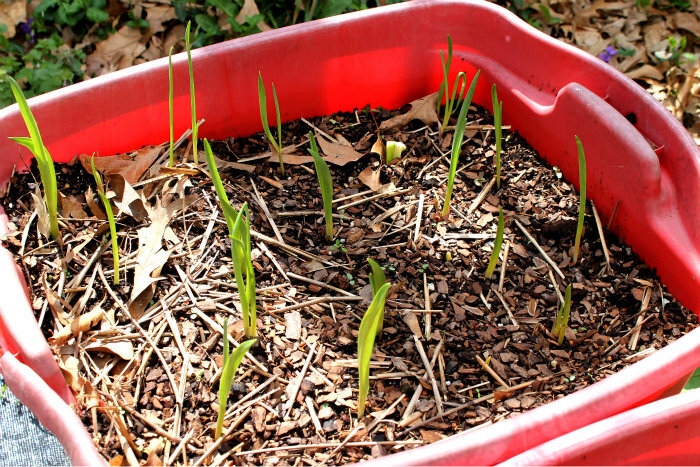 I finally found Garlic cloves for planting and decided to turn some of my garden tubs into a garlic garden. I planted 36 Early Italian Garlic bulbs in two containers like the ones below. I found the bulbs from Burpee Seed site and I was real happy with my purchase. Good planting and harvesting instructions came with the cloves. 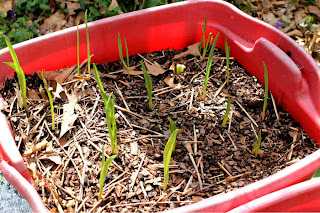 The tubs in the photo were planted about 10 days ago and you can see how they have grown. 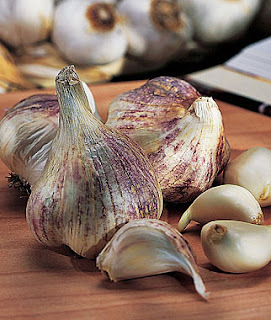 I will let them grow until they turn brown just like onions do when they are ready to harvest. I'll braid the stems and hang in the pantry for winter use. I've been looking thru some of your older posts about how you set up your container garden using plastic tubs. I had some questions about the PVC pipe and watering, and it seems that one of the links that might explain it doesn't work anymore. Are your containers "self-watering" or does the pipe just direct the water to the bottom of the container? How big are your containers? I revised the way I did them and left out all the pipes and shelves. I drilled a 1/4 inch hole about 3 inches up from the bottom on each side and filled with soil, still added the layer of fertilizer. This way was much simpler and water still stands and wicks up from the bottom. Also keeps snails from making a home in the airspace created by those pipes! I hope this helps.